While Diastasis Recti is a diagnosis, it is also a symptom of a much larger issue known as Functional Core Weakness. Both conditions contribute to aches, pains, and dysfunctions in birth recovery that, when left untreated, will continue to take a toll on your body’s ability to function. Understanding the connection between your body’s design and the physical demands of motherhood is the first step in rehabilitation. Although some of this may seem like a typical postpartum recovery, it does not have to be this way. All of these symptoms indicate functional core weakness and risk for diastasis recti. You have a group of core muscles that are primarily responsible for holding you up. The main muscle in this group, the transverse abdominis, is beneath your other abdominal muscles. It is the only muscle that wraps completely around the body to have a front, back, right, and left aspect all in one. It is essentially a natural corset designed to elongate the torso and balance the entire body by securely connecting the upper and lower body. When this muscle is strong and active, it is your largest postural muscle, holding your organs up and in, and provides stability for your spine. 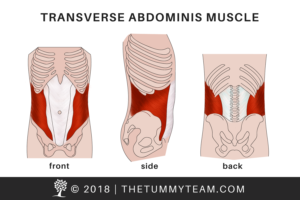 During pregnancy, the transverse abdominis muscle is intended to support the uterus and promote optimal fetal alignment for the baby. 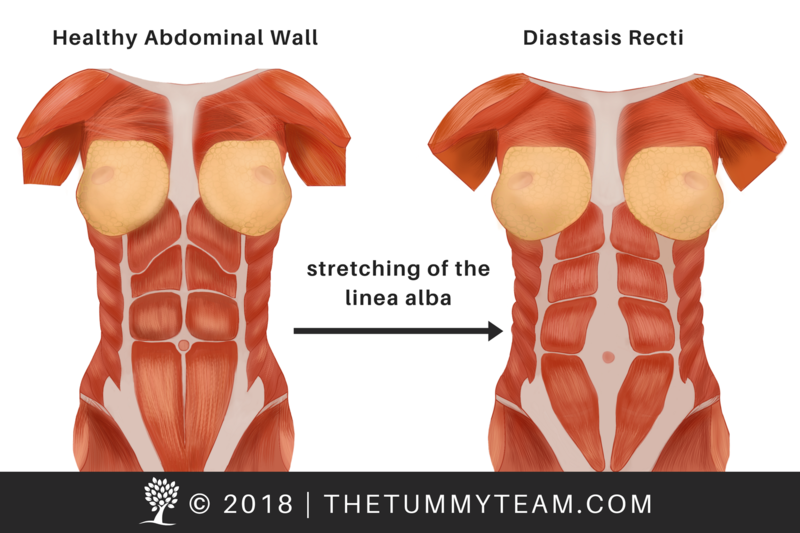 If the core is too weak to provide the needed support, the uterus tends to tilt forward, putting pressure against the connective tissue of the abdominal wall (linea alba), slowly stretching it out. During labor, if the baby is tilted forward instead of aligned vertically, contractions can be ineffective and labor can stall. This can create a lengthy and ineffective pushing phase that includes holding the breath, and curling the body and bearing down which creates even more pressure on the abdominal wall and pelvic floor. Newborn care requires constant challenging postures including holding the baby, nursing, changing diapers, carrying baby carriers and so much more. A functionally weak core leads to collapsed postures and forces your body to compensate for lack of strength with consistent forward and forceful pressure against the abdominal wall. Forward forceful pressure looks like bulging the tummy while sitting in poor postures, bracing, breath holding, bearing down for bowel movements, or tensing when lifting. The chronic abdominal pressure from the combination of poor fetal alignment, ineffective pushing, and/or compromised postures has made the connective tissue of your abdominal wall (the linea alba) weaker, causing that midline separation between the right and left sides of the abdominal wall. Because the abdominal muscles help support the back and organs, a separation will cause your support system to be weakened leading to instability and pain. The overall Functional Core Weakness also contributes to digestive tract issues, menstrual cycle issues, chronic back pain, and pelvic floor weakness. 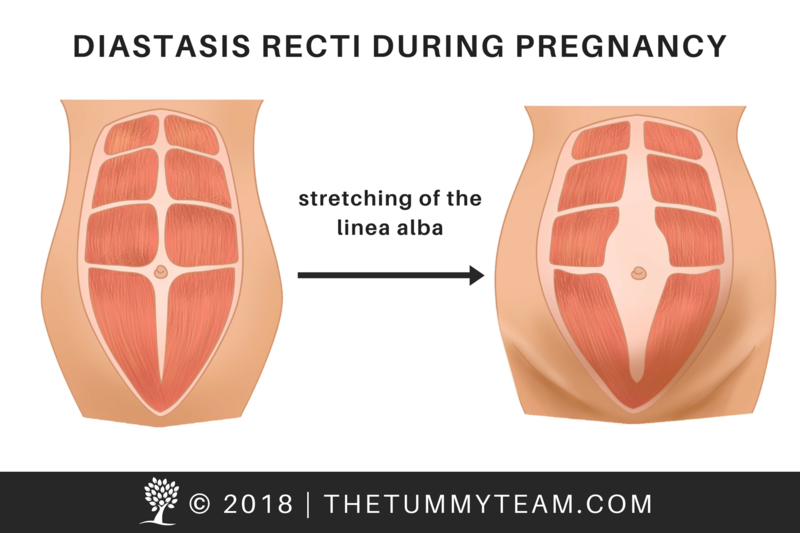 While pregnancy is not the cause of Diastasis Recti, postpartum women can be more susceptible to developing this condition in part due to the hormones that affect connective tissue. (Learn more about the influence of hormones on healing diastasis recti). Unlike what most people are told, diastasis recti does not require surgery and can be corrected with functional core rehabilitation. You will be amazed at how rehabilitating your core will affect your entire body and energy level. Our Functional Core Rehabilitation process will strengthen the core, minimize movements making it worse, reconnect you to your body, close the separation, flatten your belly, relieve back pain and other symptoms, as well as retrain your body mechanics, posture, and alignment for long-term success. Explore how our programs can help you. Not sure you need rehab? Take this 1-minute assessment.